After six years, my daughter requested this cake for her birthday. After making it the way I typed it here, the first cake was a disaster, flavorful yes, but it literally fell apart. 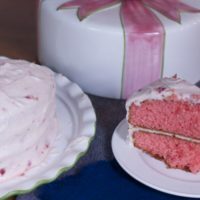 Fortunately, I personally know Ellen,a reader who sent me this recipe after reading the strawberry bread post. This is her aunt’s recipe, who was 102 years old when she sent the recipe to me six years ago. I had to remake it and provide better photos for this well deserved strawberry cake. This year I did not go to a strawberry farm but fortunately even this late in the year, you can still find reasonably priced strawberries. You could used defrosted berries as well. This info is not relevant in October, but if you are reading this post during strawberry season andlLooking for a strawberry field near you, go to pickyourown.org for locations and picking tips. Anyway, Ellen I hope I made you proud as I tweaked it a little bit and was not sure if it was made as a sheet or layered cake. This was extremely moist and easy to make. The kids enjoyed smashing the strawberries and watching the white cake mix turn pink. Well they did 6 years ago, this time they were all in school and I was the one making the cake hoping it would turn out the second time. Allow to cool completely on baking racks. Since the cake split the first time I did not add the strawberries but if you reduce the amount to 1/2 cup instead of the 1 cup, I think you will be fine. I made the frosting a little differently this time as well since my daughter loves cream cheese frosting. 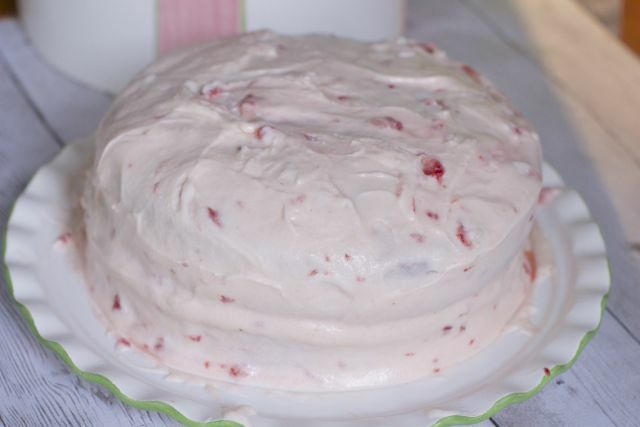 With the addition of fresh strawberries I recommend making the frosting and allowing to sit in the fridge for 30 minutes to harden. I then did a crumb coat, placed it back in the fridge and then finished it. This cake needs to stay in the fridge! If it was made in a 9-13 pan I can see how this icing would work perfectly. It was a little challenging as a two layer cake. Thought I would give you a bigger shot as well as you can see how the frosting is more like an icing. 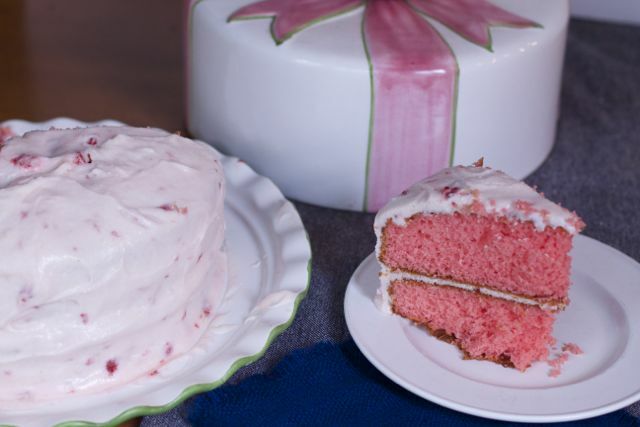 Strawberry Cake Recipe handed down generations. This strawberry cake that starts with a box mix. Blend jello and cake mix. Add oil and water then eggs, one at a time. Add 1/2 cup of strawberries last. Pour into two 9 inch round baking pans Bake at 350 for 25 min. Allow to cool completely on racks before frosting. 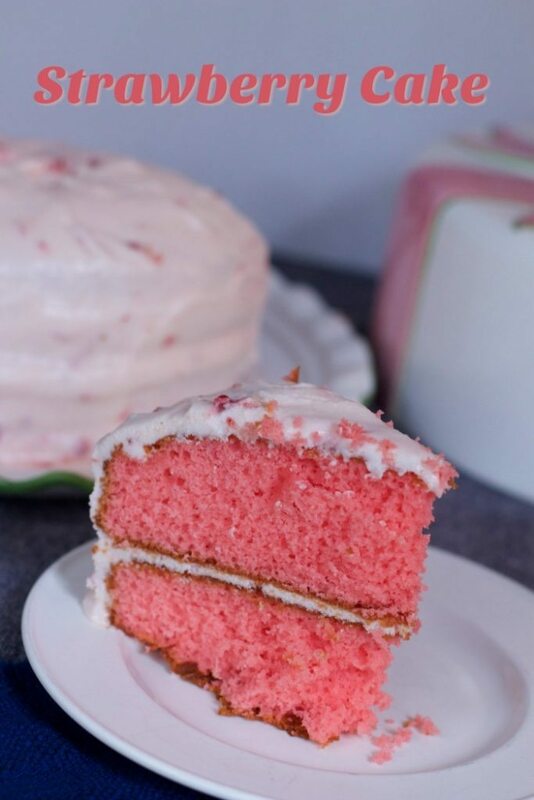 cream one stick butter and add 1 box of confectioner's sugar, alternating sugar w/ 1/2 cup mashed strawberry's. 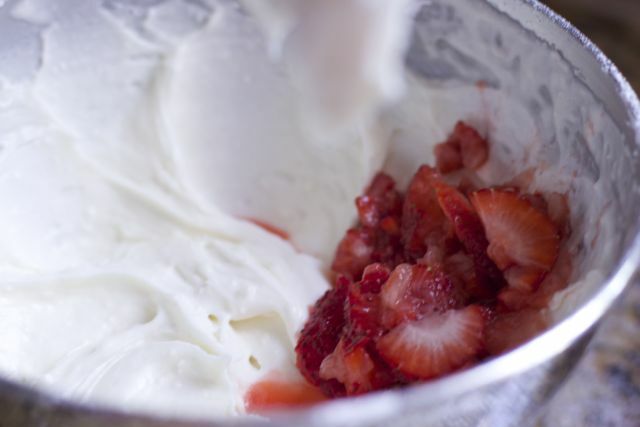 Cream the butter and alternate the strawberries and the sugar until spreadable. I like to harden the frosting in the fridge for about 30 minutes before frosting. It’s so moist and yummy! When frosting a cake place pieces of parchment paper underneath to keep the cake plate clean! Also I put the frosted cake back into the fridge for a few minutes to harden up. thanks Jake, glad you found it. This looks so good, Maria!!! Yum!!! Thanks for sharing! 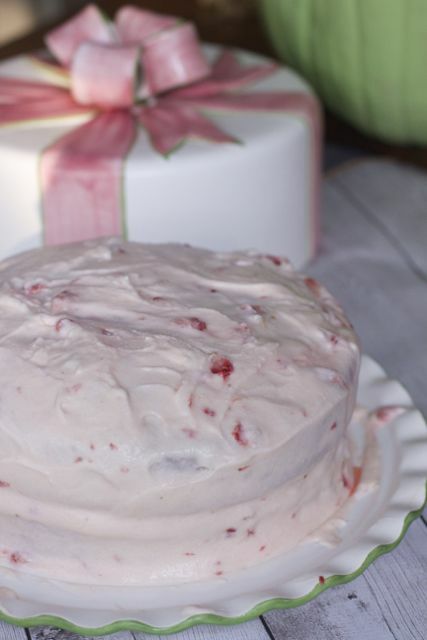 The first time I made this strawberry cake, I put a few smashed berries in the cake. If you did a sheet cake it might be better that way. IT’s not even my aunt but thrilled to share another recipe that should live one. 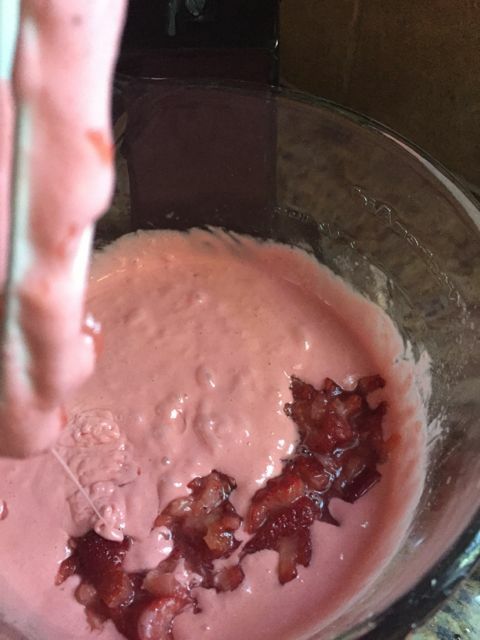 You could use thawed frozen strawberries too. . This cake looks absolutely delicious! Loving the fresh smashed strawberries in it! Not sure what I’m more excited about…how delicious this sounds or how pretty it looks! Great recipe! Love!! What a sweet story! I love that you’re keeping this recipe alive!